It’s human nature, I guess, to pursue goals that are indicators of success or proficiency in whatever our chosen field of interest happens to be. For the golfer it may be a hole in one, or shooting a sub par round. For a gardening enthusiast it might be the perfect rose or the pumpkin that tops three hundred pounds. As anglers, we all dream of landing the big one, the 20” or better brown trout, 10-pound walleye or 20-pound pike. In our efforts to improve our odds, we invest our time and money in scads of outdoors publications, seminars, videos and television shows that are all dedicated to providing us a leg up, offering information that will help us unlock the secret to finding and hooking the elusive fish of our dreams. Like many of you, I suppose, I’m often approached by friends or neighbours seeking that sort of information; the tip, tactic or honey hole I’ve discovered that will help put them onto the fish that will fulfill whatever personal standard of excellence they’ve established. I’ve been reflecting on this recently, and quickly came to a startling revelation about the largest fish I’ve caught over the years and how best to translate what I’ve learned to others. Take pike for example. Like many other Albertans, I believe that an honest 20-pound or better northern is the benchmark of excellence. For many years I fished pike diligently over a variety of waters and times of year, utilizing a plethora of the latest tactics and gear, all in vain. Sure, I caught my share of very respectable fish in the 15- to 18-pound class, including some that a creative fisherman could easily have sold to his buddies as a 20-pounder, but none that absolutely, undeniably tipped the old Toledos past the 20-pound mark. That is, until the day I was trolling along a rocky drop off on a favourite lake with a long time friend and fishing partner. I was working a large floating Rapala slowly along the edge of the drop when my plug and the boat were simultaneously jerked to a virtual standstill. I immediately set the hook, and spent the next ten minutes coaxing the well-hooked leviathan up from the bottom, knowing all the while I had a bragging-sized fish on the end. Eventually I eased it up alongside the boat, where my buddy flawlessly tailed it, then held it aloft. It was a gorgeous northern pike that easily passed the magical 20-pound plateau. The irony of it all, however, was that our watches at the time read 12:00, bang on. Midnight, that is. We were actually fishing for walleye. I mean who in their right mind targets pike at that time of day, or night as it were? Adding to the irony, I boated another similarly sized pike not twenty minutes later. So much for everything I’d learned or heard about targeting monster pike, supposedly daylight feeders only. 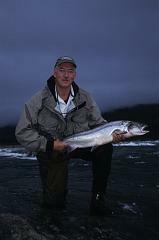 Another of my quests for years was to land a 20” or better rainbow trout on a dry fly. 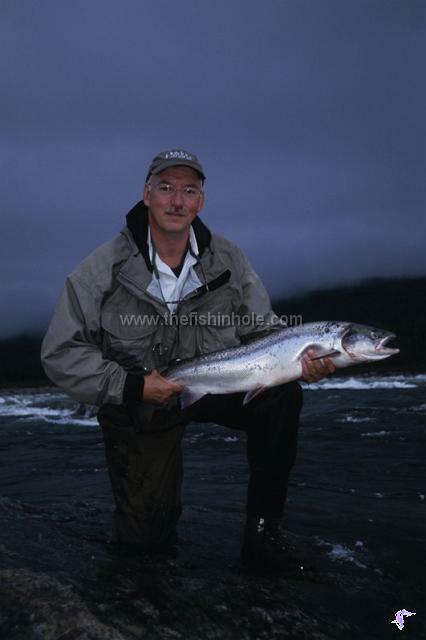 Over the years I’d hooked and lost a few, and caught untold numbers in the 17” – 19” range. But an honest 20-incher to the hand continued to elude me. On the fateful day in question I was fishing the renowned Bow River with a friend. In truth we were actually guiding some executives that day. Well, even more truthfully my friend was guiding; I was along more as an able-bodied oarsman. None-the-less, I’d had the opportunity to wet a line on numerous occasions during the day before we eventually shut it down for the evening. We were staying the night at a small cottage on the river and after dinner I decided to head down to the dock and cast a few flies for the sheer fun of it. Surprisingly, at least to me, in the next thirty minutes I hooked and landed three 20-inch ‘bows from the dock. Go figure. Docks are seldom mentioned in the textbook procedures for targeting big river rainbows. My best yellow perch is a similar story. A real slab, pushing the scales to a pound and a half, I caught it while trolling a chartreuse Wally Diver for walleye in another popular northern lake. I wasn’t even aware that there were perch in that lake, but who was I to argue? My best Alberta sturgeon? Caught while fishing walleye in the North Saskatchewan River. My first 20-inch brown trout landed that wasn’t on the Bow River? Smacked him in the Clearwater River while killing a little time waiting for a mechanic in Rocky Mountain House to finish repairing my ailing truck. The common thread among my personal “best” fish stories is pretty evident. In every case I was either targeting a different species or I was doing little more than fishing for the pure joy of it and to pass a little time. In my case, anyway, the lesson is clear. The harder I’ve tried to catch a truly big fish, the less success I’ve had. Conversely, the more I’ve relaxed and simply enjoyed my time on the water, the better the “luck” I’ve been blessed with, at least when it comes to hooking big fish. 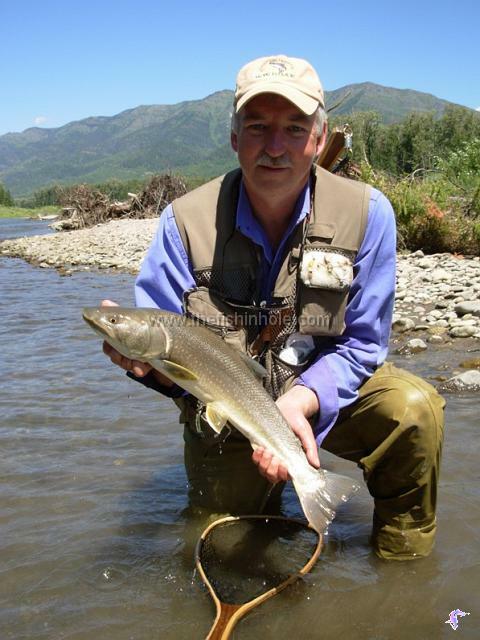 Maybe there’s a lesson to be learned here for other anglers searching for their own trophy. I’m not suggesting for a moment that anglers not heed the words of wisdom passed on by successful, experienced anglers in this forum or from any other source. In fact, their advice can typically be taken to the bank as being based upon a solid foundation of demonstrated, historic success. More often than not, their ideas can help most of us become better, more consistent anglers. Learn from them and undoubtedly you’ll have fewer fishless days, and your ratio of fish caught to effort expended will improve. But big fish, true trophy fish, I’m starting to believe, are caught with no apparent rhyme or reason. They are where they are. Certainly it helps to be fishing on waters with the potential to produce large fish, but beyond that I’ve become a believer that pure, unadulterated luck plays a huge role in the process. Maybe the very best advice in seeking a trophy is wrapped up in the old adage that you can’t catch fish if your hook’s not in the water. In other, simpler words, if you want to catch a big fish, go fishing. Since my revelation, I’ve quit “trying” to catch big fish and have been rewarded, oddly enough, by catching more of them. I’m much more relaxed now, with a clear objective of fishing for the enjoyment of the experience, and I seldom specifically target trophy fish. Just this summer, while fishing a favourite cutthroat stream, I tied on a weighted streamer for no other reason than the excessive wind was making casting dry flies a horribly frustrating experience. Three casts later I was rewarded with a personal best bull trout; I hadn’t even been thinking bull trout when I threw my line. Reflecting upon it, fun was the very reason I started fishing in the first place, and I’m having considerably more of it now that I’ve purged any thought or efforts dedicated to big fish from my mind. Sure, I still like to catch large or “trophy” fish as much as the next angler, but an emphasis on just enjoying my time on the water and gratefully accepting whatever results has actually made me a better fisherman.